Whether you are looking for a place to just unwind and escape the stresses of everyday life or enjoy some time away with family and friends, the all new Baha Mar Resort has it all. Located in Nassau, Bahamas where the translucent clear blue waters meet the white sandy beaches, and just five miles away from Nassau International Airport, the Baha Mar Resort is comprised of three hotels in one: the Grand Hyatt, the Rosewood and the SLS Hotel, each one offering something that will suit your particular needs. 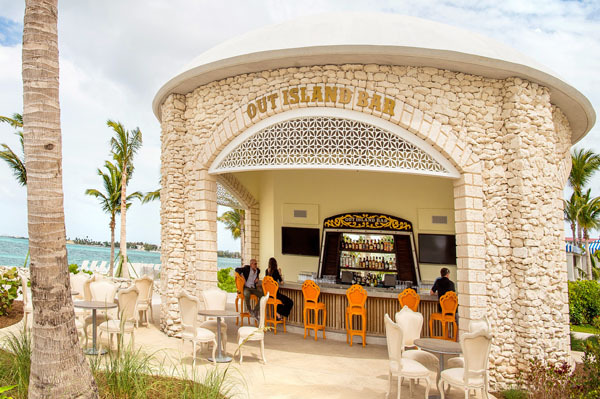 The modern and stylish bohemian-inspired five-star resort offers everything from gaming at its massive casino, the Caribbean’s largest, to exquisite dining and nightlife. Did I mention the Baha Mar also has a stunning Jack Nicklaus Signature designed 18-hole, 72-par signature golf course that overlooks the ocean skyline for those who enjoy golfing? This resort really does have it all. As for my unparalleled first-class experience, it started at the Nassau International Airport where I was greeted at the private Baha Mar Welcome Center by some very friendly Baha Mar employees in charge of car service. Waiting for my arrival was a kind driver named Daphne in a luxury SUV ready to bring me to the extravagant five-star resort. When I arrived I was greeted by the friendly staff. Check-in was quick and easy and before long I was in my stylish and luxurious Ocean View Suite at the SLS Hotel. The view of the sparkling ocean from the balcony was both relaxing and alluring to say the least. I started off my vacation by relaxing poolside at the SLS Bungalow Pool. Here I enjoyed refreshing cocktails and a delicious poolside lunch. 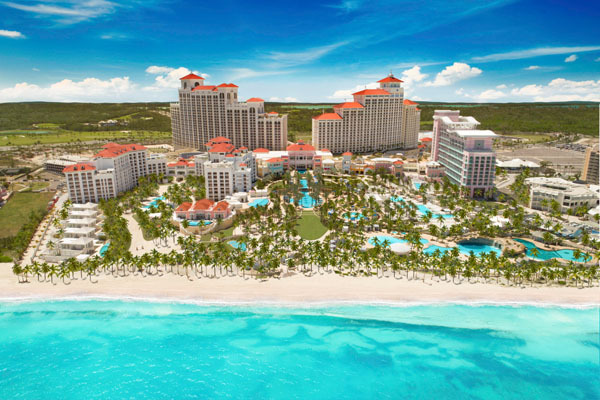 The Baha Mar offers seven pools for guests to choose from. At the beautiful private beach guests can enjoy lounging, and for those who are seeking more active pursuits, there are water sports and aquatic activities as well. There is also the BEACH Sanctuary where guests can learn about and even participate in a feeding experience with nurse sharks, stingrays, sea turtles and tropical fish. For adults 18 and over, enjoy chic and lively music and drinks over at the Privilege pool party at the SLS Hotel. Rent a cabana with bottle service or simply grab a drink at the bar and enjoy the pool under the sun. This trendy spot is a lot of fun. Out of all that the Baha Mar has to offer the culinary experience at the Resort is unforgettable. 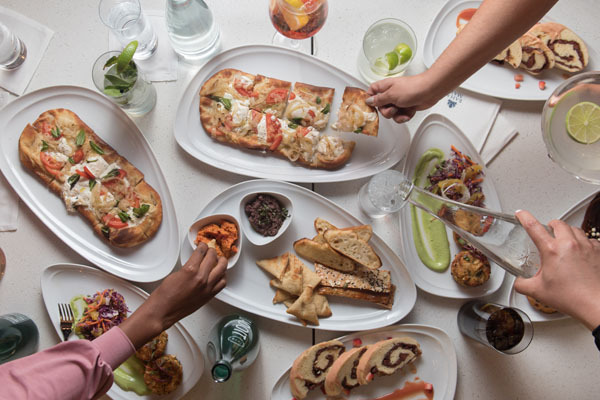 The Baha Mar Resort has over “40 restaurants, bars and lounges offering incredible meals made by celebrity chefs and expertly crafted signature cocktails.” My experience dining at the Resort was unforgettable. 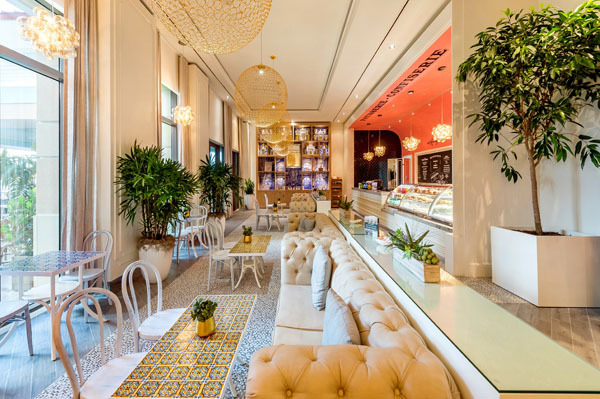 Start the day off by having breakfast or maybe just enjoy a cup of coffee at Baha Mar Café Madelene. From Nutella Crepes to specialty classic breakfast options, the Café is a must. The service is prompt and you can enjoy an outside patio space to relax, converse and enjoy your breakfast. Did I mention they offer gelato and other desserts for those who love their sweets? My first night at the Resort I enjoyed a magnificent dinner at Fi’ilia, which services honest Italian cuisine. Enjoy their table-side freshly made Caesar salad for two, handmade artisanal breads and homemade pastas. I would also recommend Katsuya for lunch or dinner. Enjoy Master Sushi Chef Katsuya Uechi’s take on the unique Japanese-inspired menu. Some of my favorite starters were the creamy Rock Shrimp Tempura and the exquisite Crispy Brussel Sprouts made with Balsamic Soy and Toasted Almonds. You then have a variety of vibrant, delicious signature rolls to choose from, especially if you choose the omakase tasting menu. One of my favorite rolls was the Lobster Dynamite Roll, its beauty as well as its exquisite taste, appealing to all the senses. It was one of the best sushi rolls I had ever eaten. You will be pleasantly surprised at how delicious the food is here. Another must for dinner at the Baha Mar is Shuang Ba, serving Haute Chinese cuisine, where the décor is just as beautiful as the food is delicious. With its detailed Chinese-influenced décor and lucky number 8 incorporated into the restaurant’s decor, including seating for 88 patrons, there is a sense of luxury and calmness. The hand-carved Peking Duck was delectable alongside an order of Shrimp Fried Rice and many other signature dishes. Shuang Ba is an experience. Baha Mar will exceed your expectations in every respect. The service is great, the culinary offerings are extraordinary and the décor is luxurious. Spend time with family at the many pools and beaches or simply get away and relax at the ESPA Spa. It’s up to you as Baha Mar has it all.